Yesterday, I experienced an impulsive longing for home. Yes, even after 7 years of living here in Seattle, the home to my guts is still Indonesia. I miss street vendors selling snacks, while it might be unhygienic, it was cheap and satisfying. My dad used to say, whatever food that is sold in a kaki lima, it’s gotta be good. It’s like the fast food of Indonesia, minus the trans fat. I especially miss Padang food, where they’d take out several dishes at once upon your arrival. So you just pick which dishes you want. You don’t even have to wait to order. There’s a saying, hit the ground running. This is “hit the chair eating”. Or if you decide to get a take-out, they’ll wrap your food in banana leaves. Hot food + banana leaves = heaven. I think the hot food helps permeate its fragrance. I usually like their rendang, cooked brains and cassava leaves in coconut broth. But since it was an impromptu lunch, and I didn’t have cassava leaves in hands, I tried using collard green. It has the pleasant bitterness that cassava leaves offer, I didn’t expect it to work this well. Served over hot rice, it felt almost like home. 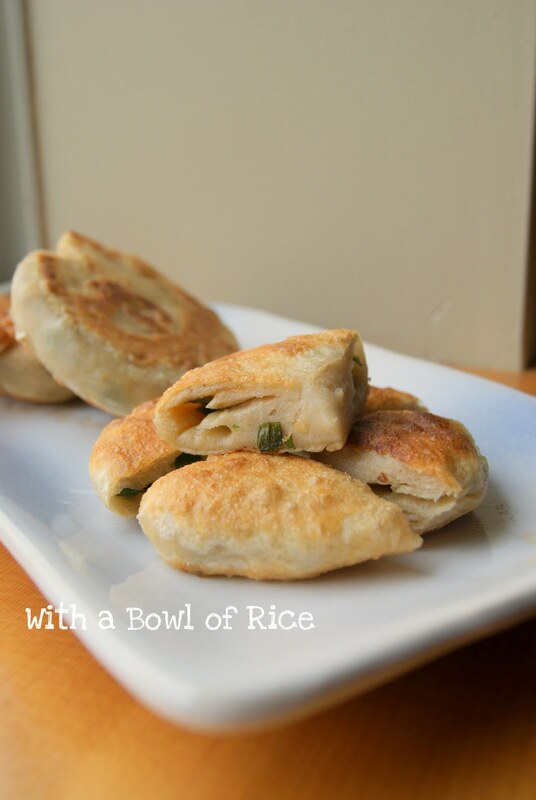 Puffy, Chewy and Delicious Scallions Pancakes. Most of my girl friends’ weakness is always desserts. When choosing snacks, sweets will always be the number one choice. As much as I love chocolate, I find myself craving for salty, savory snacks almost every day. Sometimes the snacking urge is so sudden, I need a quick fix. Opening a bag of chips isn’t it. The other day, my son and I were reading the dimsum book, with beautiful illustration that never fails to whet our appetite. We stopped at the scallion pancakes recipe. Last time we had it, it was about 3 months ago. He wanted it, I wanted it. The decision was made, “scallion pancakes for brunch!”, we cheered. Beside being so delicious, it is fun to make, too! These puffy golden pillows would make a great appetizer. Cut into smaller wedges and serve with toothpicks if you’re feeling fancy. I can’t believe I used to hate bitter melon. The bitterness is actually so natural now, I can’t have enough of it. Funny how my son loves it, although it’s not his “favoritest” food, he doesn’t show repulsion (like I did) at all. Kids nowadays are so picky, I’m glad mine is not! Although I love heavily spiced food, sometimes I crave for something simple. Something that won’t overwork my taste-bud. While I prefer to cook meat and poultry in strong spices, I prefer not to tinker too much with vegetables. One of my favorite ways to serve vegetables is to cook them until they’re tender, then just sprinkle with kosher salt and black pepper. Plus, now I have another child, simple food that doesn’t require long hours of cooking means I get to spend more time with the kids (although to be honest, I kind of miss spending long hours in my kitchen). 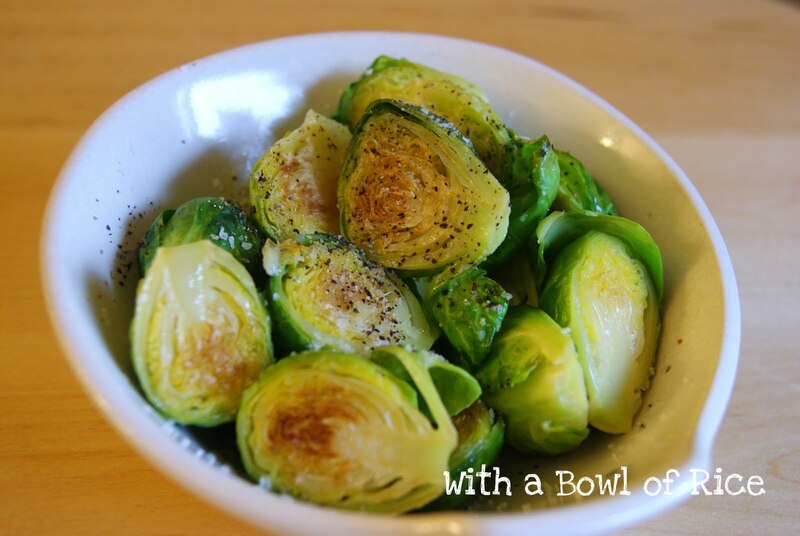 I was lucky enough to find decent Brussels sprout over the weekend. 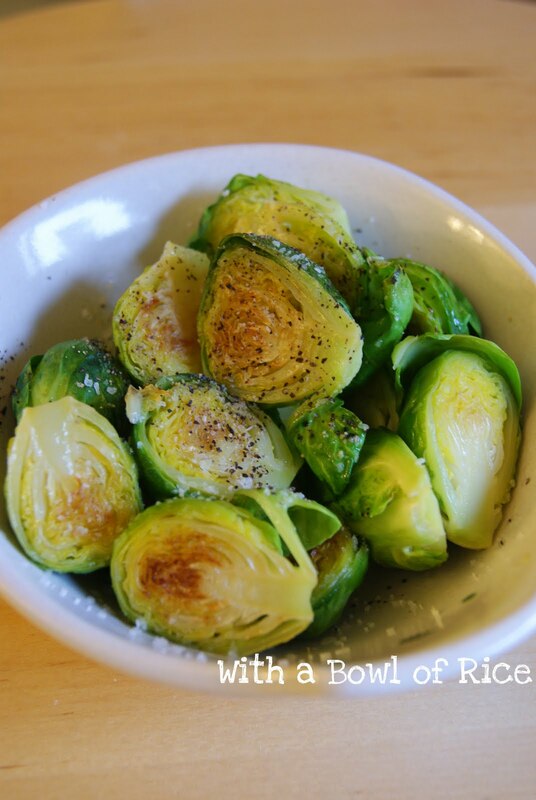 Sometimes I think Brussels sprout is so unpopular, whenever I see them at the Asian grocery store I frequented, they’re so old and sad looking. Their leaves always look wilted. They rarely stock it, hence my assuming it’s unpopular. So you can imagine how excited I was when I found beautiful looking Brussels sprout! And of course, that’s what we had for lunch today, along with some chicken and dong gua (winter gourd) cooked in Chinese herbal soup for my cold-ridden son. Didn’t get to take the picture of the soup though. I’m so thankful that he still has great appetite despite him being sick. 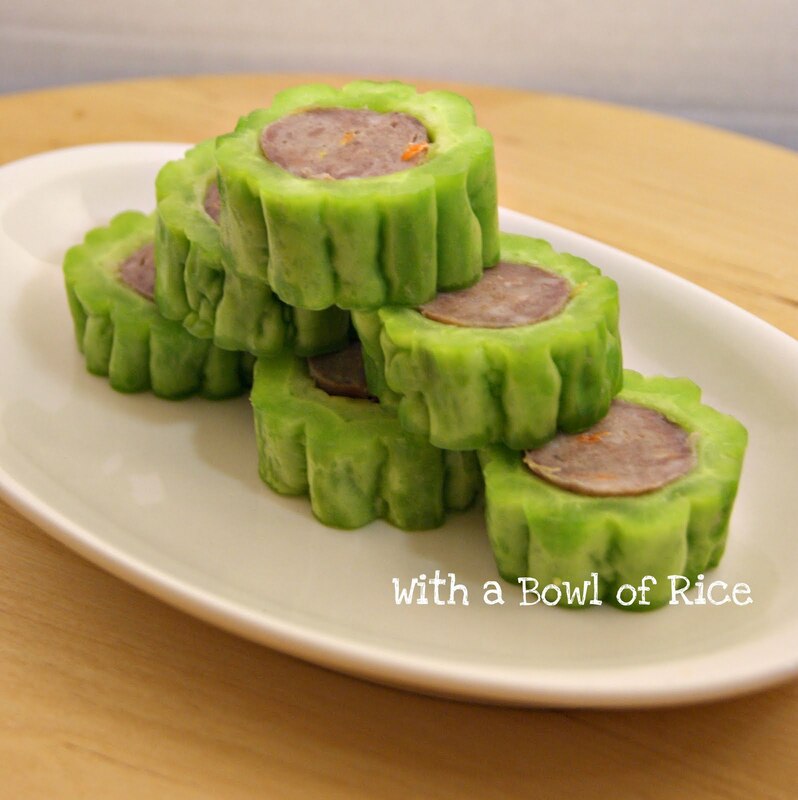 I was on a quest to find sausage casings yesterday, and somehow read online that Uwajimaya sell it (they don’t). So we went to Uwajimaya to look for it, but me, the compulsive shopper saw a box of miso and remembered how I’ve been wanting to try to use miso. The direction on the box suggests tofu and wakame (seaweed). Luckily I still have a box of tofu at home, it’s one of my staple ingredients. 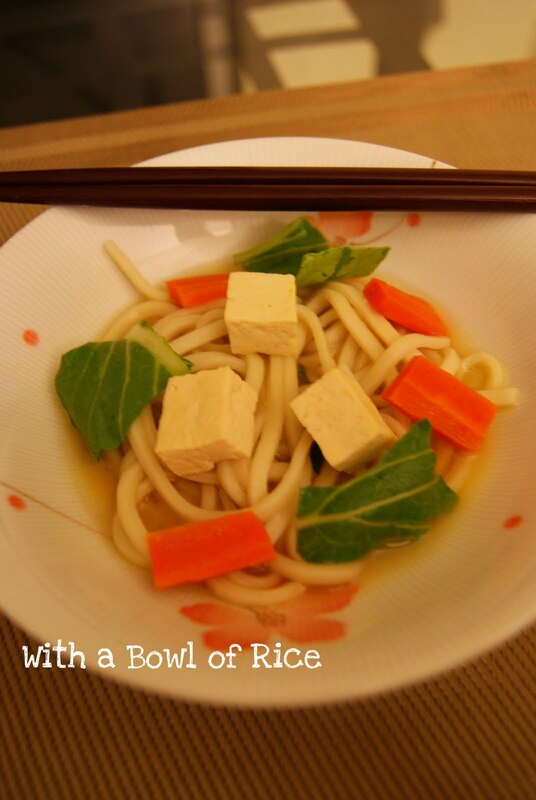 From what I looked up online, lots of recipes suggest noodles to be served in miso broth too.